Disclaimer: I received a review copy in exchange for an honest review. It’s release day! A.D. Ellis is thrilled to share her newest contemporary romance in Torey Hope: The Later Years. The reviews are in! Betas and ARC readers LOVED Sawyer! Sawyer Morgan has a secret. Revealing his true feelings to his family could bring devastation and destruction, so he keeps the burden firmly on his own shoulders. When he moves back to Torey Hope to help with the family business, Sawyer’s hidden truth becomes too much to bear. Luke Hamilton has a past overflowing with emotional and physical scars. A promise to his dying mother prevents him from seeking the love and acceptance he longs for. Taking a job in Torey Hope brings Luke face-to-face with taboo desires he thought long extinguished. Secrets, lies, hatred, and fear threaten to destroy their lives. But, love has the power to overcome and lay claim to victory. Will Sawyer succeed in proving to Luke some connections are worth fighting for? A poignant tale of two hearts valiantly fighting to stay true and find love. 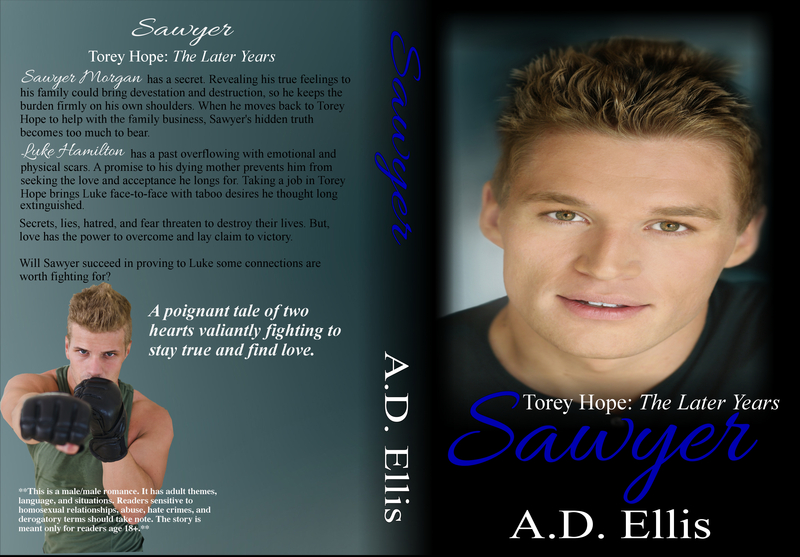 Sawyer by A.D. Ellis is a beautiful romance that emphasizes the importance of love. Sawyer highlights the difficulties some LGBT people face as they come to accept their own sexuality and come out to others. The small town setting is a place I could picture living, but it also gives the story more depth because it is a small town where everyone knows everyone else and homosexuality is not common. I loved Sawyer’s huge close-knit family, but I especially loved Uncle Nicky and some of the crazy stuff he said! The story is at times heartbreaking and infuriating because of the violence and hatred endured by the homosexual characters. However, the romance is sweet, and the love scenes are hot. Sawyer by A.D. Ellis is a fantastic read that doesn’t shy away from the difficulties of being LGBT or of learning to love. I highly recommend reading it.